After awhile trying to maintain accountability over your key system becomes downright irritating. Let alone a drain on your business's time and resources. Adopting a computer managed access denial solution — with credentials instead of keys — is a smarter way to go. The IEI ProxPad plus by Linear is a best of breed single door access controller. It allows you to assign PIN codes, prox cards, or PIN + prox card, to permit passage. 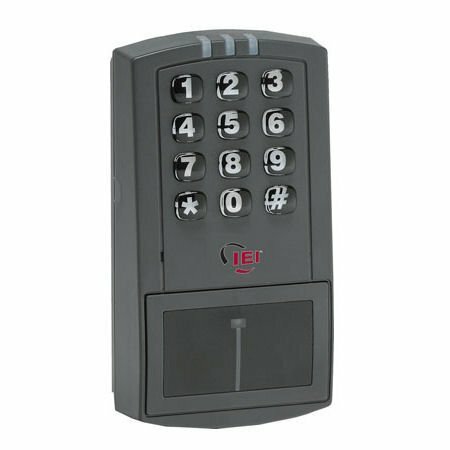 Because ProxPad is a fully integrated proximity card reader access system, you will be able to easily, quickly, and affordably manage doors and users at the keypad for basic access control. Or, for enhanced functionality you can use Hub Manager software and a workstation PC on your network, or your office laptop with a direct USB serial connection. Growing with ProxPad plus is no problem either. Thirty-two doors can be networked together and administered from one PC with the software. ProxPad Plus is designed to release electric strikes and electromagnetic locks upon a valid request for entry. Choosing among systems can be a daunting task. We like the IEI ProxPad Plus because it simplifies the task of finding a solution that can adapt with your business security needs. 5.25 (H) x 2.75 (W) x 1.375 (D) in. Unit was a replacement for an existing unit that got taken out by lightning. Installation went fairly smoothly. Since the product has so many possible configurations the instructions were a bit complex. Yes, but you will need to have a power supply that can supply 12v to the keypad and 24v to the strike. You can purchase the PS904 8F which will allow you to make that work. Please contact our commercial sales department to ensure that you get the right products for your needs. Answered by the admin The keypad can be wired for both backlit illumination or for it to be shut off. It is completely dependent on your desired configuration. No, this is a hardwired unit that requires connection to a PC or is used as a stand-alone device with code or proximity card. For a BLE lock credentials, we have two options the RS2000 and the Ultraloq, but they are both light office items and not designed for standard commercial use. No, the cards must be purchased separately from the prox.pad plus. You can purchase the prox cards or the prox tags on our site. Yes this uses the HubManager software which does allow daily scheduling. The Prox.Pad Plus comes with this software pre-installed. A No it cannot. A power supply will be needed to provide DC power in the form of 24VDC or 12VDC. *just wanted to clarify as someone not familiar with electricity may purchase a transformer per the previous response.